Our Veterinary nursing team has both a wealth of experience and youthful exuberance which together provides a dynamic combination. We are very fortunate to have a group of such enthusiastic, dedicated and caring nurses who day in day out provide exemplary pet healthcare and also endeavour to provide our clients with the peace of mind that their pet’s specific needs will be met. The stand out difference is the way in which they treat our patients as if they were their own, and the many special relationships that have been formed with our wonderful clients. Kelly gained a Bachelor of Psychology from Deakin University in 1998. She started working at Brandon Park Veterinary Hospital in 1999 and has since completed her Veterinary nursing certificate. Kelly is one of our most experienced senior vet nurses with exceptional animal handling, surgical nursing and patient care. Her thoroughness, and considerate nature along and her “can do” attitude, has seen her become an integral part of our team, and leadership group. It is however her dedication to good customer service, as well as the strong bonds she has formed with clientele that gives her the most satisfaction. Having grown up and lived in Glen Waverley, as well as having worked at Brandon Park Vet for so may years she is well recognized wherever she goes. In her time off Kelly enjoys finding new playgrounds to explore with her daughter Jessie. Kelly also loves hitting the shopping strips from time to time, which Jessie has taken a liking to as well. Kelly has a sweet German Shepherd named Roxy and a beautiful Bull Mastiff named Ozzy who is a big teddy bear! 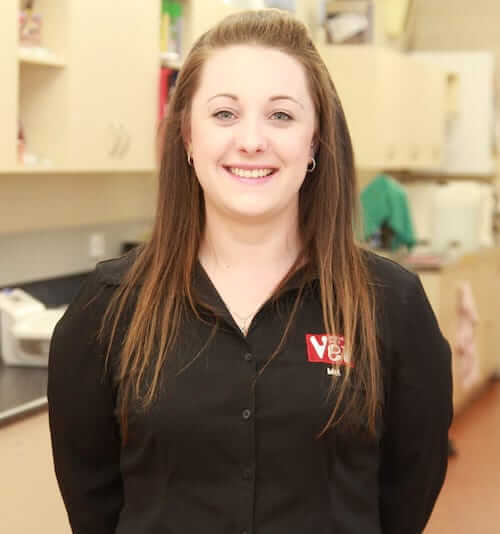 After working in the hospitality field for several years, and volunteering at various animal shelters in her spare time, Erin’s true passion for animal care guided her into a career in Veterinary nursing. She joined the team at Brandon Park Veterinary hospital in 2006 and is now one of our senior vet nurses. Erin’s genuine concern for our all our patients and incredibly compassionate nature has seen her quickly become a favourite and easily recognizable with many clients. Erin has completed her Certificate IV in Veterinary Nursing. She also has an interest in helping our injured wildlife. Life certainly got a whole lot busier for Erin and Husband Simon after the arrival of her son Noah in 2012 and daughter Mackenzie in 2015. Erin has two energetic Staffies, Roxy and the youngest Goose who can be a real trouble maker when he wants to. 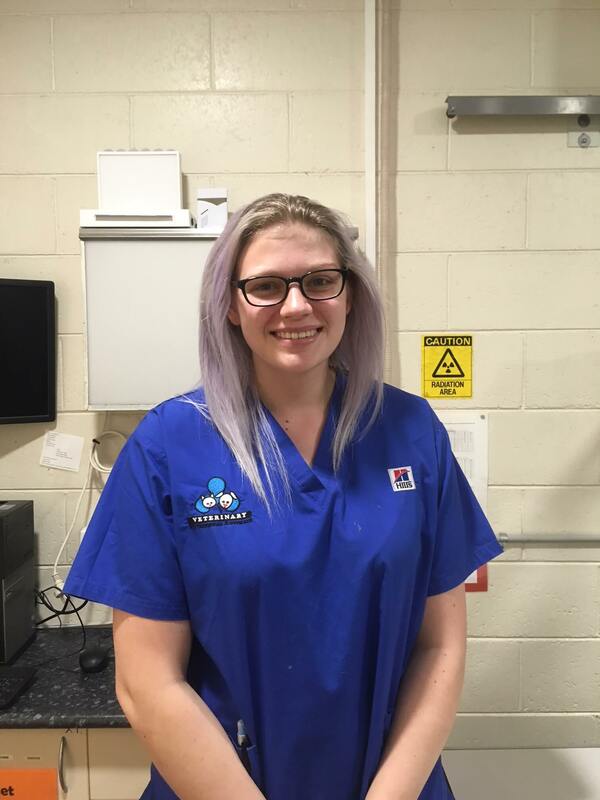 Nicole has joined us in 2008 after deciding that she wanted to pursue a career in veterinary nursing after having worked in the animal kennel industry for several years. She has a very calm, confident personality when combined with her strong work ethic has seen her become an important member of our team in a very short period. Nicole is one of our senior Puppy school trainers and helps coordinate and run our puppy school program. Nicole and her partner Mel have three kids: big sister Mahalia and middle brother Sebastian, and have just welcomed baby Luna in 2018. They also share a household with two smart little Jack Russell Terriers, Toby (who has helped Nicole with her dog training qualification), and Lola (aka Lolli). They also have three cats, birds, fish, chickens and her most unusual acquisition has been a stick insect by the name of Spiny (who now also has lots of little sticks around). In her spare time Nicole enjoys time with her friends and pottering in her garden. Nicole is currently on maternity leave following the arrival of her third child. 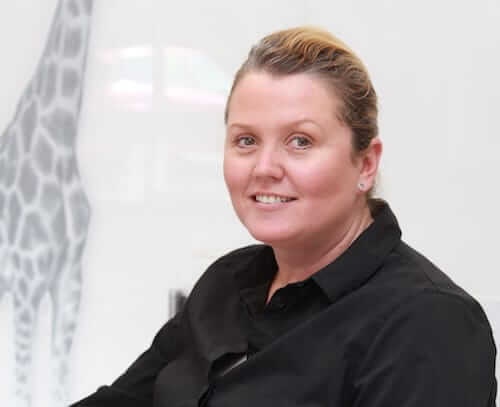 Melissa joined our team in 2012 having completed a period of maternity leave after the birth of her beautiful Daughter Mikayla, Mel has been a Vet nurse for over 12 years and brings a wealth of experience along with an exuberant and bubbly personality that has made her a welcomed edition to the team. Melissa enjoys all aspects of Vet nursing, from theatre nursing to patient care, but in particular enjoys the personal interactions with our wonderful clientele at reception. Having completed her delta dog training course Mel is also heavily involved with our Puppy Pre-school and is currently the coordinator of our pet fit program. 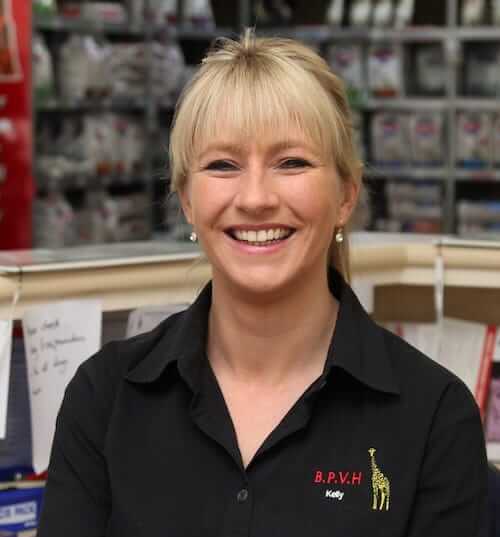 Mel also manages our large pet nutrition range. Cara joined the Brandon Park team in September 2017, and has been a vet nurse for five years. She has a real passion for working with cats and is a self-confessed “cat lady”, though likes to work with our canine friends as well! Cara has two daughters, Baylee and Piper. Outside of work, Cara enjoys taking her kids to the movies, and even just staying in for a good Netflix binge. She also loves riding motorbikes and camping trips. Cara has three cats called Teika, Kitty-Mia and Peanut, and also has Lexi the Staffy. Pam joined us in 2016 when she decided that being a Veterinary nurse was what she really wanted to do. Pam has had 10 years experience as a medical receptionist after a time being a full time mum to her three kids. Her passion for animals steered her into Vet nursing and ultimately to us. Pam is training towards her goal of being a qualified Vet nurse, but in the meantime has been a big help as a nursing assistant and receptionist.. Her warm smile and soothing tone has been warmly welcomed by both clients and pets. Tamsin hails from sunny South Australia. 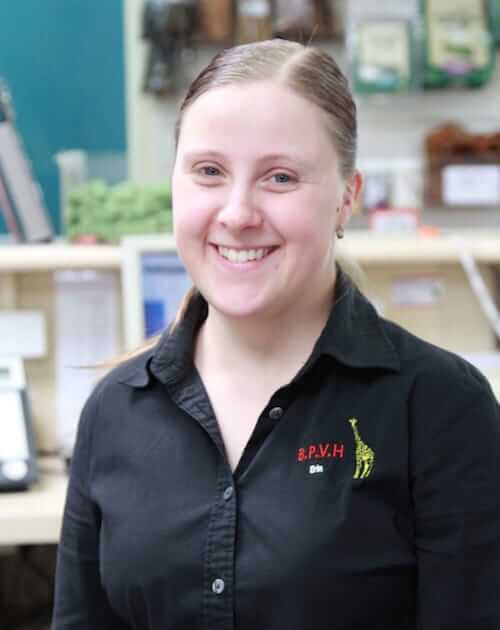 She was born and studied in Adelaide, and has spent three years as a small animal nurse in Adelaide before joining the Brandon Park team in 2018. 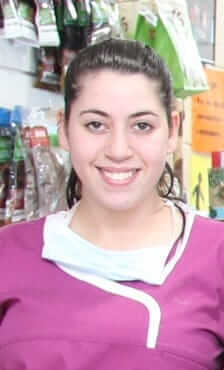 She completed her Certificate IV in Veterinary Nursing at Gilles Plains in 2014. In her spare time Tamsin loves to travel, having done a big trip to Europe last year and is headed all the way to Japan in 2018! She has a very well-loved Boxer named Frank, and a very smoochy senior cat named Harmony. Tamsin is friendly and enthusiastic, and can’t wait to meet everyone and their pets at the hospital! Sarah was born in Clayton and spent a few years in Narre Warren, but has ever since live in Berwick. She studied at the Australian College of Applied Animal Studies and achieved her Certificate IV in Veterinary Nursing in 2017. 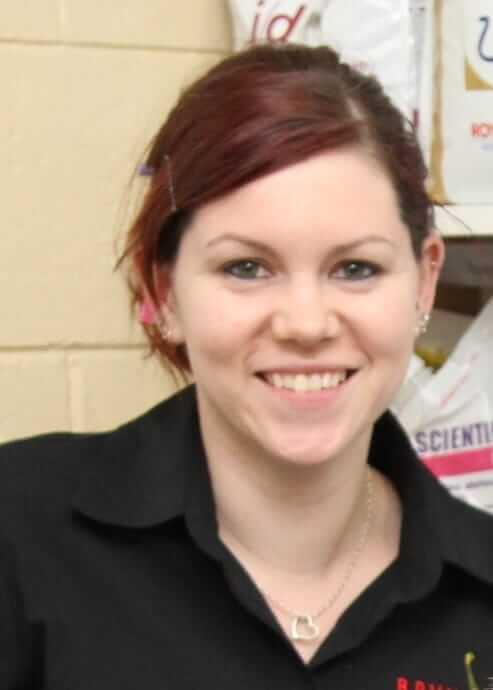 She has worked in small animal clinics in Melbourne before coming to Brandon Park in 2018. Sarah plays basketball for Pakenham Youth League as a centre. Aside from basketball, Sarah is a big motorsports fan, particularly fond of V8 Supercar events. She has two dogs at home – Pedro the Golden Retriever X Lab and Harley the Border Collie cross. She also has her grandmother’s dog Bonnie the Jack Russel on permanent loan! Cathy began work at Brandon Park Veterinary Hospital in 1980 after completing a Bachelor of Education and deciding teaching was not for her! Cathy heads the veterinary nursing team and still thoroughly enjoys all aspects of veterinary nursing. 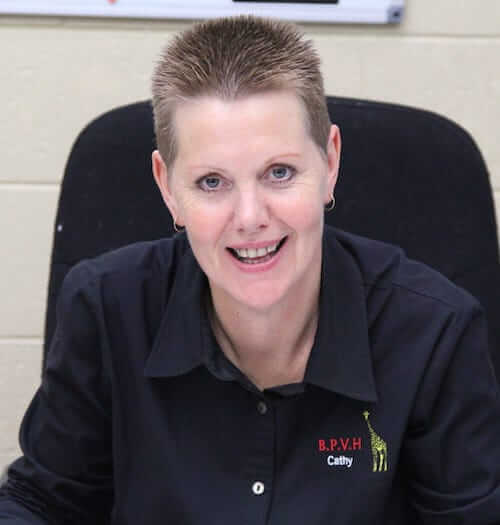 Over her time at Brandon Park Vet, Cathy’s infectious smile and warm greetings have endeared her to many clients and pets alike. Her customer service is second to none and her attention to detail and respect for client needs act as the benchmark for all our staff. Combined with her senior veterinary nursing role, Cathy is also the Practice Manager, where her leadership and positive attitude bear well with all our staff. Cathy loves spending time with her husband and three children, and especially loves spending their leisure time camping with friends. She hopes to spend more time travelling with her husband over the next few years. Cathy has retired from full-time work at Brandon Park Veterinary Hospital. However, we hope to see her filling in shifts for us in the future!